Luxury and maintenance-free living combine to create a unique Fayette County property at the Townhomes at Ellerslie! Commonwealth Designs incorporates immaculate finishes and upscale amenities throughout these ranch and 2 story designs. New townhome lots are currently available backing to green space with prices starting in the upper 300s. These open floor plans feature gourmet kitchens, first floor master suites, free standing tubs, walk-in showers, spacious bedrooms and relaxing outdoor living spaces. Ellerslie is a parcel of land with gently rolling hills, a view of Ellerslie Lake to the west and Delong Road to the southeast. Located across from Jacobson Park, this cove is secluded and private with little development nearby. Featuring 77 acres of greenland, exquisite stone walls and a town square style fountain, located 3 miles from I-75 and shopping and less than 5 miles from downtown Lexington and Kroger Field. These townhomes are marketed by Signature Real Estate. Call Reece Miller for your private showing. 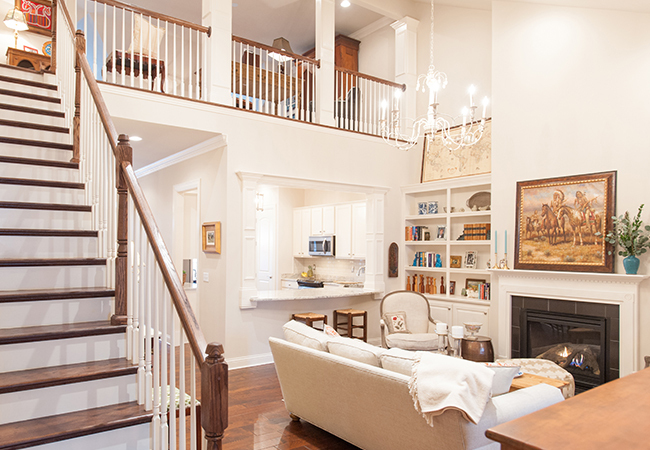 This beautiful renovation was created by Architectural Kitchens & Baths and Pickett Homes. The large open format was accomplished by removing 20 feet of the rear wall in order to add a family room off of the kitchen. The remodeled area features clean classical cabinetry, but with some unexpected elements. Custom floating shelves made from reclaimed wood and a custom copper hood give the kitchen personality. Designing a space that is virtually a blank canvas allows Pickett Homes and homeowners to come together to collaborate on anything they can dream. This 2,400 square foot penthouse loft offered plenty of room for creativity. “Mine and Barbie’s favorite element of this project is the monochromatic theme and open floor plan, all accentuated by the glass staircase wall, glossy white cabinets and cream marble accents throughout,” said Bill Pickett. Pops of Wildcat blue and fun LED lighting in the great room bar area provide a punch of personality. Hager Cabinets, Inc. began in 1967 when Bob Hager began building homes for friends and acquaintances. 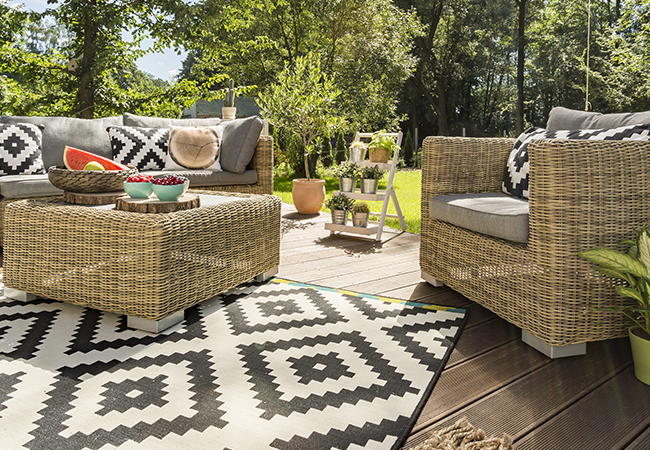 As the business grew, Bob and Oberita Hager opened a warehouse and showroom in Richmond. Bob said, “Our focus has always been on quality products, careful planning, and skilled building at an affordable price.” Today, they continue to offer top quality cabinetry and exceptional customer service. Waypoint, Decorá, Aristokraft, & Diamond Cabinetry as well as door, window, flooring & building material specialists who can help you make the perfect choice for your next project! 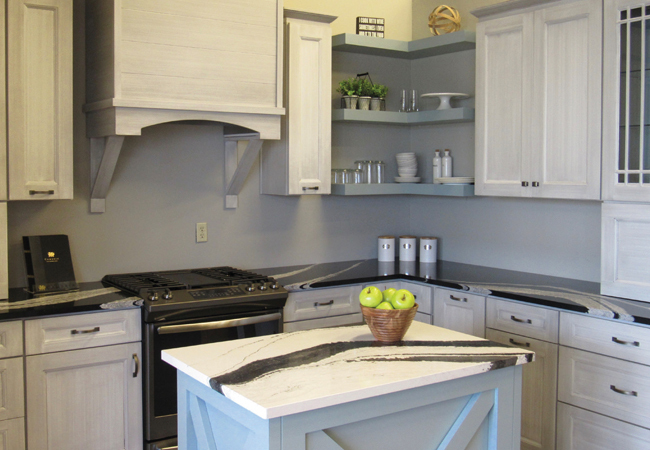 This corner kitchen at Hager Cabinets and Appliances in Lexington showcases full overlay Roslyn door Decora cabinets. 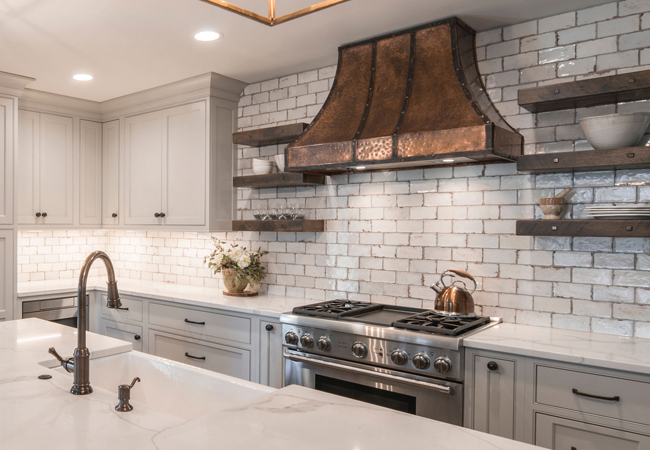 With shiplap on the range hood and floating corner shelves, this kitchen display seamlessly blends an inviting farmhouse style with modern elements. This space features a combination of two finishes: a hand-brushed Onyx finish on white and a painted finish in Interesting Aqua. 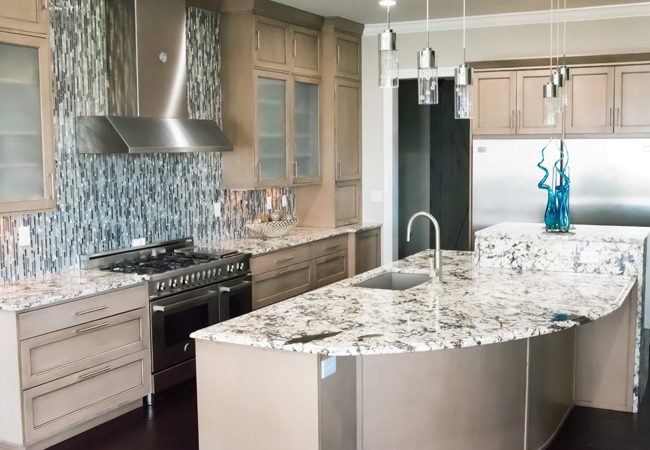 Cambria quartz countertops complete the look. This is the third home in which these homeowners have turned to j. stuart hurt for his design expertise. The fully remodeled contemporary home gave stuart and the homeowner a blank slate to mix elements such as texture and color. The dining room mixes traditional elements such as the high-back chairs at the heads of the table, with two modern chandeliers and gold framed mirrors. “Having worked with these homeowners before, I’m very familiar with their taste and preferences. Regularly scheduled meetings with them helped keep everyone on the same page and the project progress on-time,” stuart explained. stuart’s favorite element of this project is the original stone fireplace, which is located in the middle of the home. “It is a focal point that not only provides warmth during winter months, but also texture and depth in a spot that would have otherwise been a blank wall,” he said. House by JSD Designs is a beautiful home furnishing and accessories store located on Industry Road. 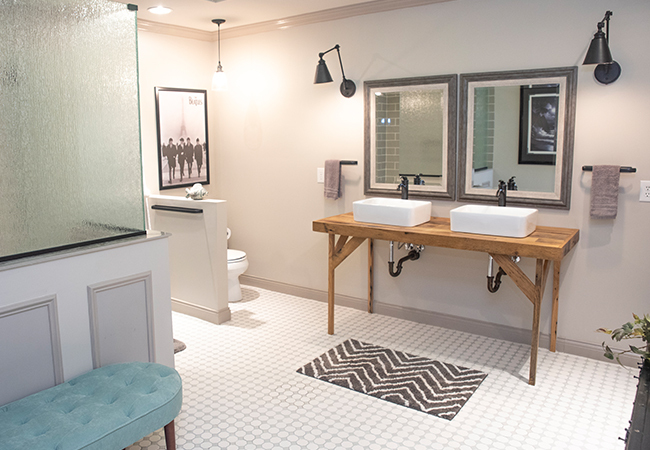 Owners, stuart j. hurt, Dwayne Anderson and Jeremy Rice—known to most as “The Boys”—not only own and operate one of Lexington’s favorite stores, but they also provide Interior Design services and custom floral design to their customers. Granite Galleria is a family-owned and operated company. 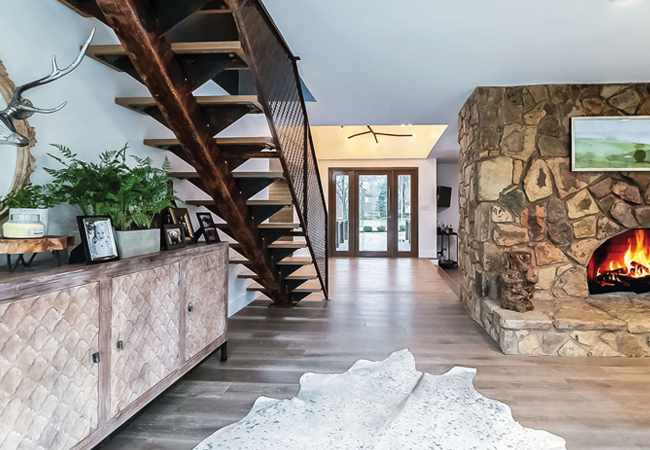 For more than a decade, they have been providing innovative design and natural stone solutions to homeowners and commercial customers across the United States. 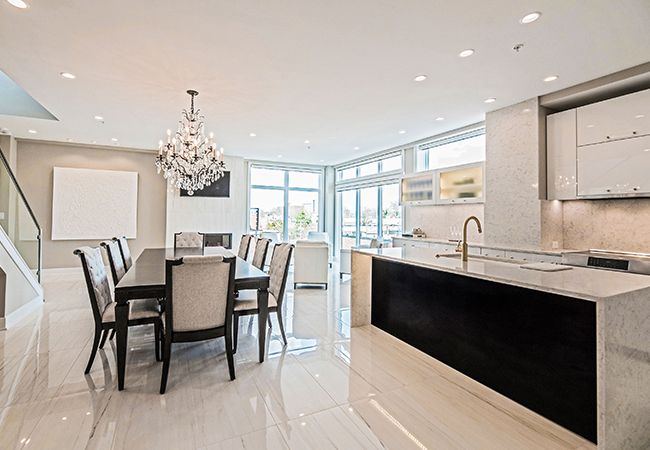 Clients can choose from a wide variety of options including quartz, granite, marble and quartzite, all while knowing that the Granite Galleria team stands behind every product from beginning to finish. 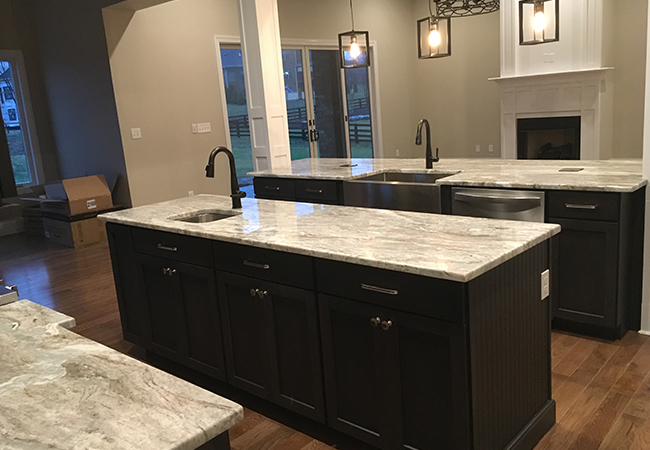 For this project, the team installed Fantasy Brown Dolomite on the island, a beautiful material that’s sealed so it’s resistant to water absorption and abrasion. For the vanity, they used Smoke Marble. Jerrod began helping in his family’s flooring business when he was just ten years-old. He is proud to continue his father’s tradition of craftsmanship. 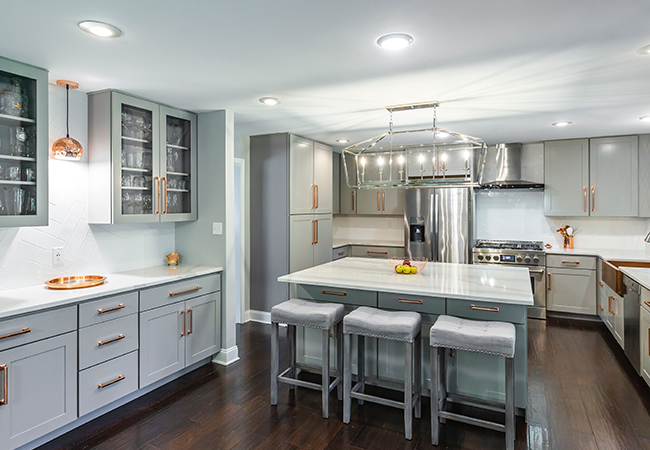 From custom flooring and tile to painting, shower installation, tubs, custom cabinets and more, Jerrod and his team can create the remodel of any client’s dreams. it also utilizes the gorgeous natural stone to its fullest potential. “The biggest challenge was finding a stone large enough to create the island without any seams,” explained owner John Orihuela. The open space of the kitchen allowed their team to install the countertops exactly how the clients had envisioned. The step up at the end draws attention to the gorgeous waterfall and adds extra utility for the clients. Kentucky Marble & Granite is a family owned business with more than 25 years of experience. “We are experts in natural stone, including the fabrication and installation,” John explained. They handle countertops from designing the digital template, fabrication to installation with granite, quartz, marble and silestone. This customer had trouble with contractors in the past. She wanted a newly redesigned bathroom, so she went looking for a company she could trust to do the job right. She found Right Angle Home Repair,” explained owner Daniel White. Right Angle understands the importance of trust. They’ve built a reputation of offering high-quality, first-rate home repair services. They put a special focus on creative home remodels, always done with integrity and passion. Taking good care of our trees is one of the most environmentally responsible things we can do for our individual properties, our community, and our planet,” Sara Hesley explained. “Their care should be taken seriously and done properly. Because our industry does not require licensure, there is a broad range of folks providing services that fit into the category of tree care. From planting to removal--pruning, mulching, insect & disease management, and preservation should be trusted to the experts. In 2011, Sara and Jesse combined their love of trees and expertise in the field of arboriculture to create Town Branch Tree Experts, Inc., Lexington’s only mom-and-pop, TCIA Accredited, full-service tree care Company. They assembled a team of highly skilled, internationally credentialed professionals. Jesse is one of only five ISA Board Certified Master Arborists in Kentucky and Sara is an ISA Certified Arborist. 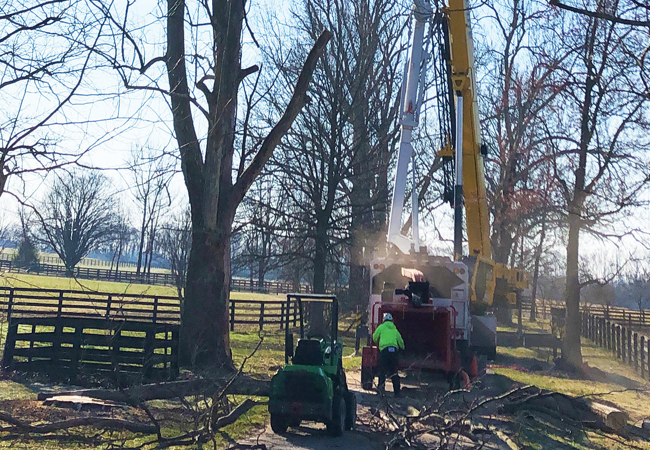 This project was a high-angle removal of a massive, dead Sycamore on the iconic Gainesway Farm. The tree was between a road and a paddock, making the removal tedious. A team of three Town Branch Tree Experts arborists worked with an 80-ton crane and crane operator to complete the project in a single day_ “Large or small, each tree presents its own unique challenge and we love always being up for the task,” Jesse said. The award winning designers of Decorating Den Interiors specialize in kitchen, bathroom and fireplace remodeling as well as custom window treatments, furniture, rugs, lighting and accessories for every style and budget. 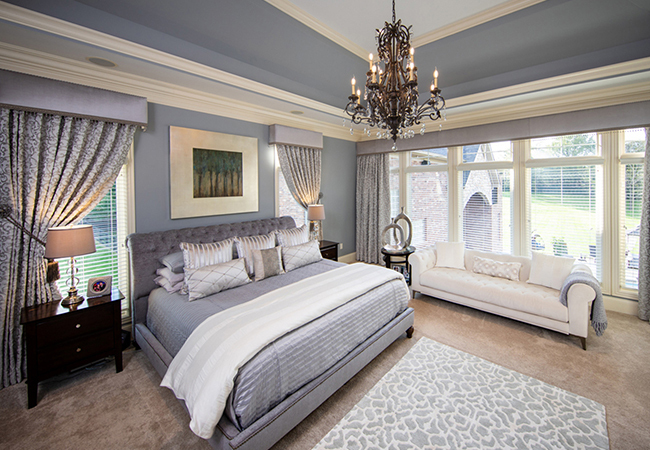 For this makeover, owner and designer Jeanne Sallee and her team helped to design this beautiful master bedroom for her client. They desired custom window treatments that would give them privacy and sun control. However they did not want to permanently block their amazing views. The windows were quite large and the draperies had to be custom made in order to be fully operational. Custom pillows, a new rug and strategically placed art and accessories have made their bedroom a true retreat. This client loves their stunning new bedroom! We love to help make our client’s dreams come true!